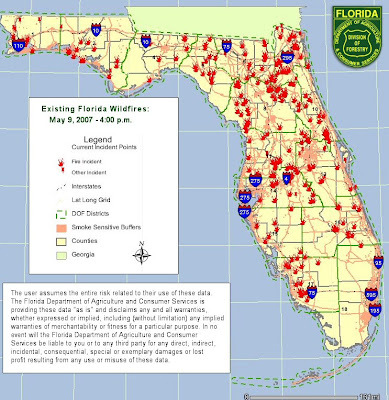 This map shows all the wildfires burning in Florida as of 4pm this afternoon. The massive fire in Georgia jumped the St. Mary's river and is threatening the homes of some of my friends and their families. They have been evacuated. This fire is just to the West of me. South of us is another massive fire that has other friends and families threatened. Please keep them in your thoughts and prayers. Prayers must work. 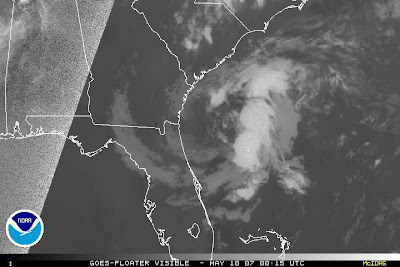 I asked for a hurricane and now we have the first named storm of the season, Andrea. Hopefully, it will rain enough to put out all of these fires. We certainly need it. This map shows the major fires in the United States right now, their locations and their names. Sweat Farm Road (9), Big Turnaround Complex (16), Bugaboo Scrub Fire (11), and Dairy Road (12) are the major ones in this area. Depending on the wind direction breathing can be difficult. The schools sent out an advisory to the students warning them if they have asthma not to come to school. Several of my friends' children have tried using this to get out of going. One girl told her father what the school said and asked it she could stay home. He said, "But, you don't have asthma--you're going." Give her credit for trying. I'm not a "newsy" type person or a real religious one either. I rarely watch the news and I can't recall the last time I was in a Church. . But, looking today at the fires across the US and the flooding and the tornadoes made me think about the end of the world. Maybe I need to research that a bit more....Okay, I researched a bit and found this explanation of the end of the world. Wait for it to load. I thought it was hilarious. But, then again I have a strange sense of humor.